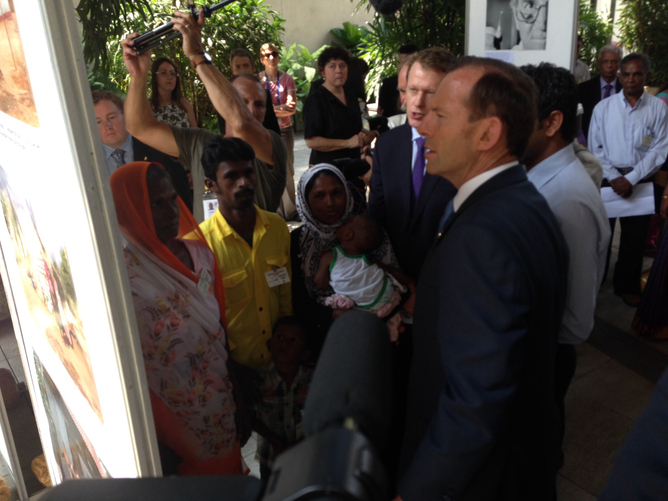 Prime Minister Tony Abbott’s performance over human rights in Sri Lanka in the last week was an utter disaster. His statements seemed to brush aside some of the most fundamental human rights values: prohibitions on war crimes, crimes against humanity, and torture. Sri Lanka finished a decades-long civil war with the Liberation Tigers of Tamil Eelam (“the Tamil Tigers”) in 2009, with tens of thousands of civilians killed in the final weeks of the conflict. Since then, Sri Lanka has been plagued by credible allegations of unmitigated brutality at the end of that war. The UN has called for an independent investigation, which Sri Lanka refuses to undertake. Sri Lanka is further accused of ongoing violations, including torture, killings and disappearances. The Prime Ministers of Canada, India and Mauritius boycotted the recent Commonwealth Heads of Government Meeting (“CHOGM”) in Sri Lanka in protest at its human rights record. UK Prime Minister David Cameron attended CHOGM, but reiterated the call for an independent investigation into war crimes. So let us turn to Mr Abbott’s statements. Prior to leaving for CHOGM in Sri Lanka, Abbott made the following comments. I accept that by Australian standards, probably things could have been done a little differently and maybe a little better. But they have had a terrible, terrible civil war … the savagery of which is almost unimaginable to Australians, and I thank God that that civil war has ended. A “little” better? A “little” differently? That is a strange way to refer to allegations of war crimes and crimes against humanity. Yes it ended brutally, but it has ended and things are … much, much better for all Sri Lankans, Tamil and Sinhala. …They are much better for all Sri Lankans now that the civil war has ended and I praise the Sri Lankan government, not for everything it has done, but I praise the Sri Lankan government for having managed to end one of the world’s longest-running and most brutal, awful civil wars. Abbott conflates two things. The end of war is a good thing. But that does not mean that any means can be used to end it, or that the means actually used can be whitewashed and, astonishingly, endorsed with “praise”. War crimes cannot and must not be forgotten. Abbott’s statements approve an egregious form of victors’ justice, equating it with victors’ impunity. …we accept that sometimes in difficult circumstances difficult things happen. Sri Lanka since the end of the war is much more free and prosperous, and has a better future and that’s important for everyone. Torture is absolutely prohibited in international law under the Convention against Torture. It is never allowed in any circumstances whatsoever, including in “a state of war”. Torture is in that rare category of “universal” crimes. For example, any country can prosecute and punish a torturer, regardless of the torturer’s nationality or the territory in which the torture took place. In his glib suggestion that torture happens, that it’s a little split milk in “difficult” times, and that people should move on after it happens, Abbott is purporting to shrug off one of the strongest international norms in existence, effectively exonerating some of the most vile human behaviour. Of course, Abbott’s public support of Sri Lanka over human rights has an ulterior motive. His government needs Sri Lanka’s cooperation to help it “stop the boats”. Hence, Australia has loaned two navy patrol boats to stop people fleeing a country which is accused of severe, including ongoing, human rights abuses. Apparently, the government has attached no conditions to the use of those boats, leaving it in danger of charges of complicity if they should be used for human rights abusive purposes. Fresh allegations of extreme cruelty towards boat arrivals indicate that the government has simply thrown out its moral compass in dealing with asylum seekers. Abbott’s craven abandonment of any semblance of human rights values in Sri Lanka also points to that sad conclusion. In fairness, it is not new for Australian leaders to cozy up to foreign governments by whitewashing the latter’s human rights abuses. For example, successive Australian governments displayed a deplorable tolerance for Indonesian crimes against humanity in East Timor. So perhaps Abbott’s statements are not so aberrant. Sadly, they may just be another shameful example of Australia’s willingness to eject human rights from foreign policy when it is convenient to do so. Which means it is ultimately up to us, the Australian people, to let our political leaders know that these stances are simply not acceptable in our name. This article was originally published at The Conversation. Read the original article. Sarah Joseph does not work for, consult to, own shares in or receive funding from any company or organisation that would benefit from this article, and has no relevant affiliations. Next Post Next post: Is the criminalisation of homosexuality in the Commonwealth a relic of the British Empire?